The blizzard hit last night and has been going strong ever since. This has not only caused me to be stuck inside, but I’m starting to go through my movie collection. So far I have watched Valentine’s day, Frost Nixon and now onto James Bond Casino Royale. Really there is no method to the selection today. I also had the perfect snow-day breakfast: Flap Jacked banana hazelnut protein pancakes with Cellucor’s Cor-fetti cake batter whey and eggs. Well rounded macros and super tasty. After glancing out the window, I realize there is definitely 2 feet of snow out there, and the drift of snow by my kitchen window is about 3 feet tall. There’s a high chance I made a slushy with some of the snow and an ounce of Parrot Bay Pineapple Rum. It’s a snow day and it fit my macros, but holy moly I never realized how much sugar is truly in flavored rum like Parrot Bay. I am so glad that I have cut out pretty much all alcohol during this prep. Today the only things I have accomplished is making rice to ration out for the rest of this weeks meals, watch movies and send a few work related emails. I mean I could still be in bed, so I definitely think sitting on my living room floor is a step up. Also, it brings me to the purpose of my post. There are some days when I can decide what I really want to eat and other days when I know what I want, but I’m unwilling to give up certain macros for it, so I pass. Today was the latter. With my rice and chicken already prepped all I needed was something saucy. I love Srirach and that’s pretty much what this post is about. 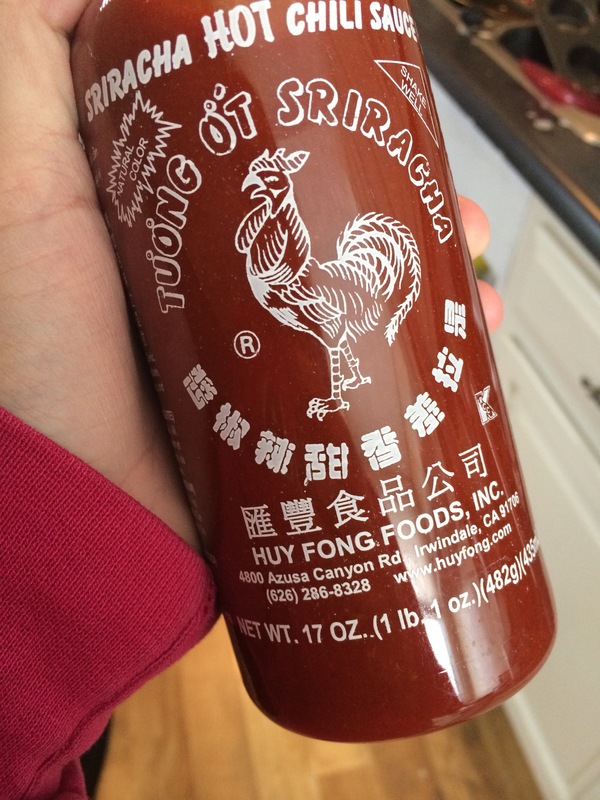 Last month I discovered Sriracha mayo at the grocery store and while it’s great on sandwiches in moderation, it’s all fat and high in it too. I’m not willing to give up 15g of fat macros for 1 tablespoon. I was determined to find an alternative that would give me the creaminess of Srirach mayo without all the fat. I wanted the kick, but I didn’t want to burn my lips off either. I use plain Greek yogurt for a million things. 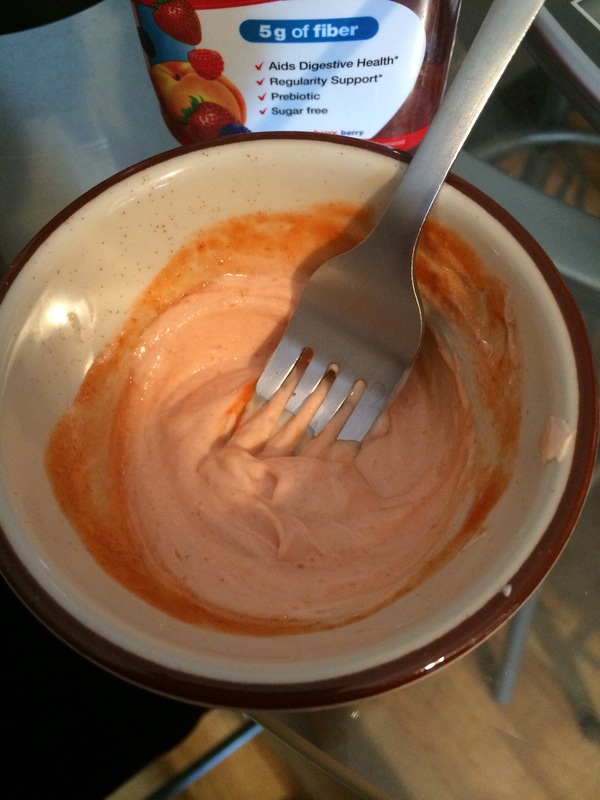 It’s a great substitution for sour cream, it’s a great ingredient for protein pudding, it makes shakes thicker and it also makes for a great sauce. Just mix the two thoroughly so you don’t get a spot that is heavily spicy. I added the mixture to my chicken and rice and it was perfect. 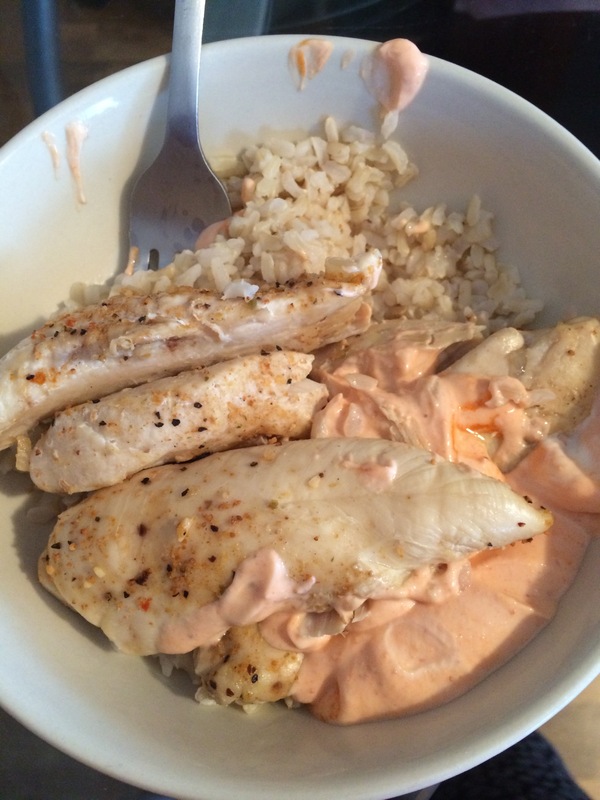 I had already seasoned the chicken during the cooking process, but the Sriracha yogurt added something to it that made it a little more fun than just some steak seasoning. I think the snow day is getting to me a little bit because I have plans to make a mini sweet potato casserole with dinner. I hope you all stay warm and don’t go stir crazy!